The Rothko Chapel is a community space. Coming here with your group is a powerful way to experience it. We look forward to seeing you here. Although reservations are not required, we encourage you to notify us so that we can help you make the most of your visit. We ask that someone from your group sign in, and, for groups of 20 or more, please arrive before 5 PM. For school groups (grades K– 8), we prefer a 1:10 ratio of chaperones to students. By request and at select times, Chapel guides are available to enrich your experience for groups. 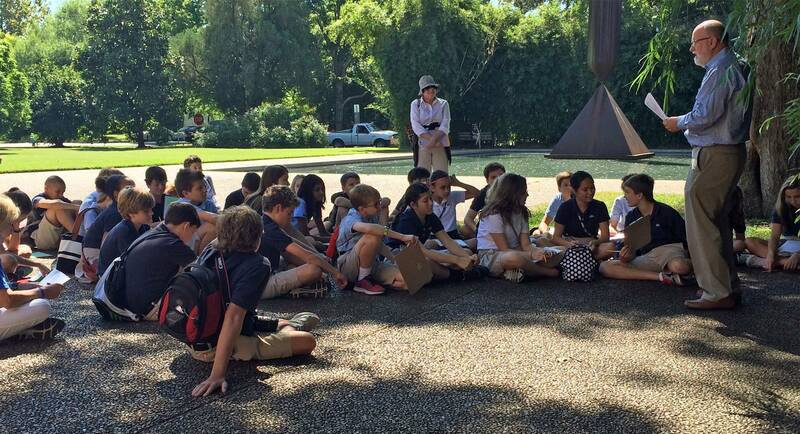 After a brief introduction, your group is free to experience the space and view the art, after which your guide leads an informal discussion about your experience, providing interesting details about the Chapel’s history and the significance of the Broken Obelisk sculpture outside on the plaza. Whether you choose a guided visit or explore on your own, please check our calendar before making your plans. To inform the Chapel of your group's visit or to schedule a guided visit, please complete and submit the form at the bottom of this page or email your request to requests@rothkochapel.org. Please respect the sacred environment inside the Rothko Chapel for all visitors by observing the guidelines posted just outside its doors and on the visitor info page. Select Fridays from 10 AM - 2 PM, Saturdays and Sundays 11 AM to 5 PM. Please contact requests@rothkochapel.org to request a guided visit. Please allow 72 hours for us to respond to your request. Suggested donation of $5 per person. You may submit your donation ahead of time by clicking here. For special considerations or visit requests outside of our standard times, please provide us with a brief message below. Please allow up to 72 hours for response.